Pepsodent is finally upping the ante online. Just a bit. About time, considering nearly every Unilever brand already has deep web destinations or social platform presence. Last week we saw rich media takeovers across a few publishers and even a Facebook Logout Banner promoting the latest ‘Expert Protection’ product TV commercial. A search campaign is also live. Posts on the Pepsodent India Facebook Brand Page have become increasingly prolific. I would think that an immediate connect on the brand page would be to look at oral care Expert Advice Q&As and bytes in line with the new campaign, but the brand page seems like a platform targeted at parents with nearly every wall post being about oral care for children. 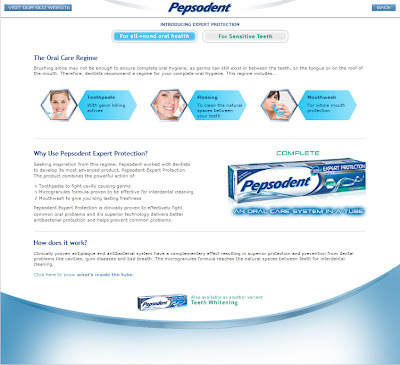 Pepsodent Expert Protection also has a vanilla two-pager site that provides details on the product and variants.